At the baby shower that we had for Kiya, a very special gift was given. Caiden, thanks to the kindness of Grammie Sue and Papa Jim, gave his new little sister to be a special, hand picked gift. 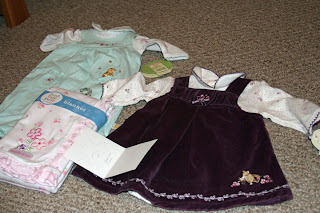 According to Grammie Sue and Papa Jim, when they took him shopping, he picked these right out and knew what he wanted to get his baby sister. They thought for sure he would pick a truck for her, but the thoughtful boy that he is, he chose a beautiful lavender and purple dress, a blanket, and a mint green outfit...all very cute. I was soooo happy that we had time to do that for you, Kiya and Caiden. We wanted Caiden to be a part of the baby shower too. He is going to be an awesome big brother. He is such a cute little boy and a good big brother!! 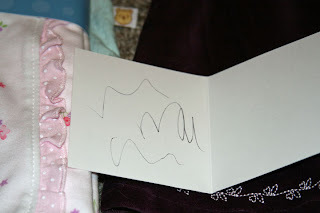 I LOVE how he signed the card!! He did such a good job picking those clothes. I especially liked the purple dress.